Vanessa Starke grew up in Blue Springs, MO and attended the University of Southern California in Los Angeles, CA for her undergraduate education. She majored in Social Sciences with emphasis in Psychology and minored in Psychology and the Law. While at the USC, Ms. Starke became a member of the Delta Gamma Fraternity and served at the Undergraduate Student Government as a Greek Senator. 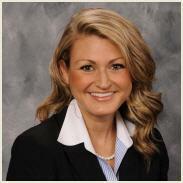 After earning her degree, Ms. Starke continued her education at the University of Missouri School of Law. While at the law school, she was involved with the school’s Student Bar Association, serving as the social chairperson of the American Constitution Society. She was also a founding member and vice-president of the Student Animal Legal Defense Fund. Currently, Ms. Starke is an active member of Rotary International. She is also involved with the Association of Women’s Lawyers of Kansas City and the Young Lawyers Section of the Missouri Bar. Her article titled "The Impact of Coy v. Iowa on State protective Statutes for Child Abuse Victim Testimony in Criminal Trials: A Case Study-Missouri" was recently published in West’s The Criminal Law Bulleting, Vol. 49, No. 1.